Last year I had a delightful green bike which Pam (ed note: that’s the motha hugga) helped me fix up. 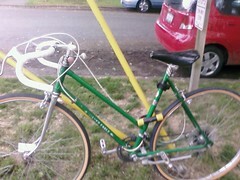 A vintage green women’s bike with funny front shifters, a leather seat, Gregg’s Cycles stickers and drop down handles. It was love, true love. We rode together, and crashed together. Then, last June it was tragically stolen out of my yard. I called the police and filed a Missing Bike Report, and was told that my chances of finding it were next to nil. Exactly a year later, this Friday I was with a friend looking for parking behind Bauhaus on Capitol Hill when we found a spot, and I got out and realized the bike locked to the electric pole was my beloved Silver Eagle! I left a note asking the owner to call me and that the bike was stolen, came back a couple hours later and found that my note was still on the seat. My friend recommended I call the police and just ask them what my options were. Within 30 minutes, the Seattle Police Dept sent a squad car with two cops (one hot), who spent an hour looking up my original missing bike report. They finally confirmed that it was mine and called the Fire Department to liberate my bike. At 11 pm, they sent a fire truck that was nearly a block long and 6 fire men to crack the U-Lock on the bike. They closed off the street for about half an hour and used probably about a $1000 of tax money. The fire fighters on the 4th try finally used a hydraulic splitter to free my bike and return it to me! (Pictures below, sorry about the low quality). Welcome home little green bike! Thank you SPD and SFD! Moral of the story: Write down your serial numbers and use a U-lock because they are impossible to break.